Dill is a distinctive plant where both the leaves and seeds are used as a seasoning. 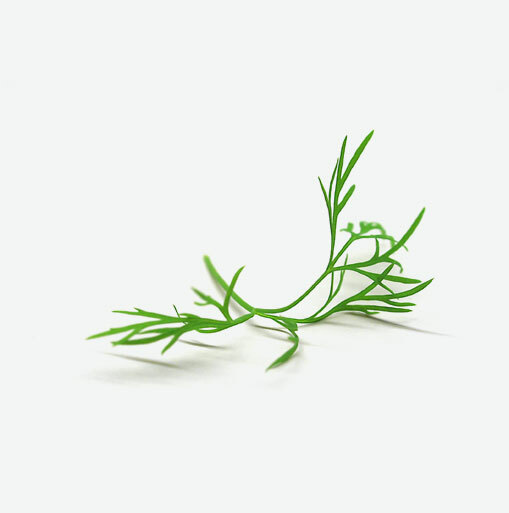 Dill has green leaves which are wispy and fernlike and have a soft, sweet taste. Dried dill seeds are light brown in colour and oval in shape, featuring one flat side and one convex ridged side. Dill’s name comes from the Norse word “dilla” which means “to lull”. This name reflects dill’s traditional uses to relieve insomnia and an upset stomach. It has been used for its culinary and medicinal properties for centuries, including by Hippocrates, the father of medicine, in a recipe for cleaning the mouth. Dill is a flavourful way to help prevent bone loss. In addition to its chemoprotective and anti-bacterial properties, dill qualifies as a very good source of calcium. Calcium is important for reducing the bone loss that occurs after menopause and in some conditions, such as rheumatoid arthritis. Dill delivers magnesium and dietary fiber as well. Magnesium helps to soothe the nerves and dietary fiber is necessary for regulating digestion. Fresh dill should look feathery and green in colour. Dill leaves that are a little wilted are still acceptable since they usually droop very quickly after being picked. Fresh dill should always be stored in the refrigerator either wrapped in a damp paper towel or with its stems placed in a container of water. Since it is very fragile, even if stored properly, dill will only keep fresh for about two days. Dill can be frozen, either whole or chopped, in airtight containers. Alternatively, you can freeze the dill leaves in ice cube trays covered with water or stock that can be added when preparing soups or stews. Use dill when cooking fish, especially salmon and trout because these flavours complement one another very well. Use dill as a garnish when serving up dishes and since dill seeds were traditionally used to soothe the stomach after meals, place some seeds in a small dish and place it on the dinner table for everyone to enjoy. Add dill to your favorite egg salad or salmon salad recipe.